I am always on the lookout for dairy free or gluten free cakes. I have extended family members who have either food intolerance and when I have parties I don't like anyone to miss out on dessert. 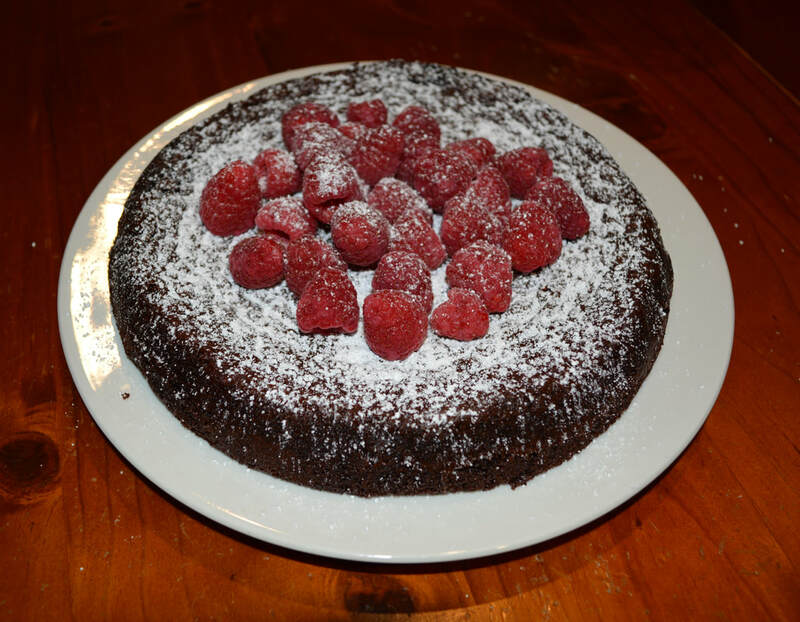 I find cakes particularly difficult to make without dairy or flour, they tend to come out less than ideal, so when I find something I love, I have to share it here. This is a Nigella Lawson cake and over the years I am trying more and more of her recipes, as one, they tend to be easy, and two, and more importantly, they taste great. This cake is something that you can serve to anyone, it is rich, it melts in your mouth, and it doesn't miss the dairy or flour. ​If you want to make it into an everyday cake for guests who don't have a intolerance to flour, then replace the ground almonds with 125g plain flour, I haven't tried it, but Nigella suggests it in her book. But in all honesty I like this squidgy cake as is. I like to serve it with raspberries and ice cream (lactose free ice cream, if needed), and I like it warm or cold. Preheat your oven to 170C. Grease a 22cm round springform tin with a little oil and line the base and sides with baking paper. Sift the cocoa powder into a bowl and whisk in the boiling water until you have a smooth, chocolatey, still runny (but only just) paste. Whisk in the vanilla extract, then set aside to cool a little. In a small bowl, combine the ground almonds with the bicarbonate of soda and salt. Put the sugar, olive oil and eggs into the bowl of a freestanding mixer with the paddle attachment (or hand held with whisk attachment) and beat together vigorously for about 3 minutes until you have a pale aerated mixture. Turn the speed down a little and pour in the cocoa mixture, beating as you go. Now slowly add in the ground almond mixture. Scrape the sides, and carefully fold with a spatula to ensure it is all incorporated well. Pour the mixture into your prepared tin. Bake for 40-45 minutes or until the sides are set and the very centre, on top, still looks slightly damp. a cake tester should come up mainly clean but with a few sticky chocolate crumbs clinging to it. Allow to cool for 10 minutes, before removing the sides of the tin. Leave to cool completely or eat warm with some ice cream and raspberries.